23 years old Kenyan Rugby star, Daniel Adongo, has become the first Kenyan to join the American National Football League Pro Team. The young Kenyan star was signed by Indianapolis Colts as a linebacker. The team went ahead to release a statement share their excitement of having Daniel Adongo join their team. Adongo, according to statement by Indianapolis Colts general manager, Ryan Grigson, is an exceptional competitor and a human being who has the right make up for their sport. They are all glad by his joining NFL and will watch his growth and development in the forthcoming weeks. Although, Adongo who was found by the scouts department of the Indianapolis Colts calls the transition to linebacker the most logical place to start, coaches and general manager, Ryan Grigson acknowledge he is a blank slate. The 6-foot-5, 257-pound Kenyan is a world-class rugby player. But he has never played a down of American football and has only watched a handful of games on television. Somehow, the Colts’ scouting department found Adongo and gave him a shot to make the roster. According to vibe weekly, Adongo attended the Strathmore High School in Nairobi after which he joined a university in South Africa in 2007 where he played in various leagues and tournaments. 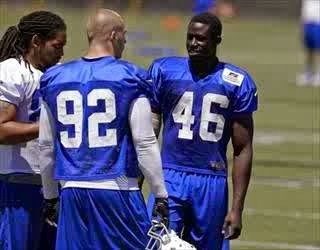 We would like to congratulate Daniel Adongo for his achievements and wish him the very best as he joins the Colts.